Many of the homes designed and constructed by CarrHomes home builders can be built to certain owner specifications. We provide our buyers with a variety of customization options, such as adding bay windows, fireplaces, ceiling details, and more. 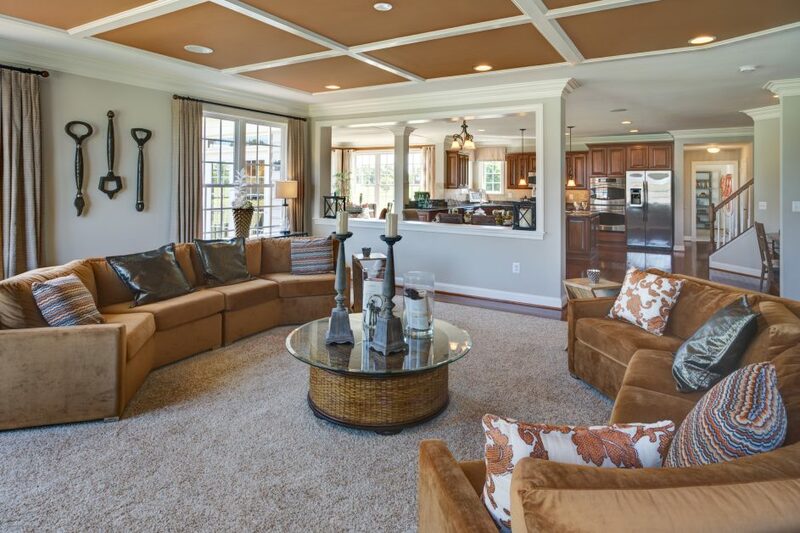 One of our most popular optional features is the square shaped coffered ceiling, also known as the box beam ceiling. This architectural feature can be designed in a variety of styles and using a variety of colors. Keep reading to view some examples of box beam ceilings by CarrHomes. The beam ceiling in this family room lends an elegant and traditional appearance to the space without overpowering the fireplace feature or the gorgeous wall of windows. Box beam ceilings such as this one are ideal for spaces with high ceilings as well as floor to ceiling features like the fireplace. The white beams on the white ceiling create depth through shadows and shapes, creating an interesting design piece without detracting from the beauty of the stone fireplace or the gorgeous natural view. This box beam ceiling, on the other hand, creates depth through the use of contrasting colors rather than shadows. This box beam ceiling features a very subtle profile with thin beams, making the ceilings appear even higher than they already are. The colors used bring a modern touch to this typically traditional feature, allowing this home to marry more traditional decorative choices with more modern ones. Coffered ceilings have been a popular architectural feature for millennia with the oldest surviving ceilings dating back to the time of the Roman Empire. Today, they lend historic character to our homes. Are you interested in looking at homes in the Fairfax area that feature box beam ceilings? Contact the home builders at CarrHomes to learn about the options we can offer you.